“A man was traveling from Washington DC to Manassas in the predawn hours Friday morning. At a stoplight, a gang broke his window and dragged him from his car. They stripped him naked, beat him to a pulp, took his wallet, his laptop, his iPhone and his car, leaving him on the sidewalk half dead. A Catholic priest drove by minutes later and stopped at the light. He saw the man bleeding on the concrete and trying unsuccessfully to stand, but it was a seedy part of town, so he continued on his way. Then a Protestant minister drove up and stopped at the light, but he too sped off as soon as the light turned green. But a Muslim, driving that same road, stopped at the light and saw the man. His heart was moved with pity, so he covered the man’s nakedness with a raincoat, helped him get in the car, and drove him to the nearest clinic. Something I wrote last week about Islam caused a bit of a stir, with one conservative blogger wondering if I had been threatened with beheading.The great Mark Steyn even wrote: “I’m sad to see the usually perceptive Ed West of the London Telegraph planting his flag on this wobbling blancmange.” Considering I am Mark Steyn’s biggest fan in the whole wide world, complete with a wall covered with pictures of him and a tattoo of his face on my chest, that’s left with me some mixed feelings. And yet I still believe that Islam has become something of a scapegoat for the problems associated with mass immigration, and here’s why. Conservatism is all about protecting the community from radical change; that is why conservatives tend to oppose large-scale immigration, which alters the social fabric in a huge way. Yet from the 1960s to the 1990s, both in Britain and the US, conservatives lost this argument, despite overwhelming public support. They lost because they lost the intellectual justification for group solidarity or “parochial altruism” against post-war radical universalism, to the extent that normal human feelings were redefined as forms of mental illness. Defeat. Until Islam came along, allowing conservatives to make arguments using language that liberals would permit. I was an athlete all through school. I played soccer and basketball for all four years of high school and all four years of college. We played a lot of parochial schools in our league. They would pray before games and again afterwards. We also played Orthodox Jewish schools and had to plan our games around Jewish holidays. I don’t ever remember there being any conflict about the fact that we were playing religiously oriented teams so I was rather surprised to read about the recent controversy in Texas. 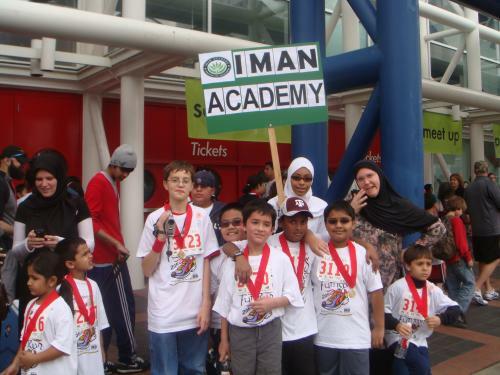 Iman Academy, an Islamic school in Texas with 500 students, was hoping to join the Texas Association of Private and Parochial Schools (TAPPS), an organization that manages competition among hundreds of schools in the state. Perhaps I shouldn’t be surprised that a traditionally Christian organization was less than thrilled at Iman Academy’s interest in membership. But I can’t see how athletic association between schools has anything whatsoever to do with religion. TAPPS has a history of religious intolerance. Recently the school refused to reschedule a game against an Orthodox Jewish team. The game fell on the Sabbath. Negative publicity and legal pressure shamed TAPPS into acquiescing but their stance on non-Christian religious observance is clear: non-Christian holidays simply aren’t as important as Christian holidays and don’t need to be respected. (Reuters) – Christian bishops in Germany, Austria and Russia have sharply criticised Saudi Arabia’s top religious official after reports that he issued a fatwa saying all churches on the Arabian Peninsula should be destroyed. In separate statements on Friday, the Roman Catholic bishops in Germany and Austria slammed the ruling by Grand Mufti Sheikh Abdulaziz Al al-Shaikh as an unacceptable denial of human rights to millions of foreign workers in the Gulf region. Archbishop Mark of Yegoryevsk, head of the Russian Orthodox department for churches abroad, called the fatwa “alarming” in a statement on Tuesday. Such blunt criticism from mainstream Christian leaders of their Muslim counterparts is very rare. 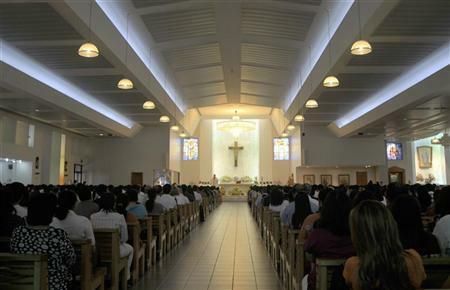 Christian websites have reported Sheikh Abdulaziz, one of the most influential religious leaders in the Muslim world, issued the fatwa last week in response to a Kuwaiti lawmaker who asked if Kuwait could ban church construction in Kuwait. Citing Arab-language media reports, they say the sheikh ruled that further church building should be banned and existing Christian houses of worship should be destroyed. 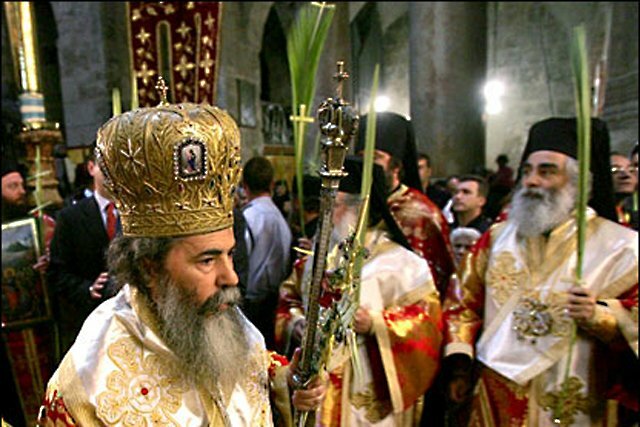 Pope Shenouda, who died on March 17, led the Coptic Orthodox church for four decades. He acted as the main political advocate for the nation’s Christians, who make up about a tenth of Egypt’s 80 million people, while Hosni Mubarak was in charge. 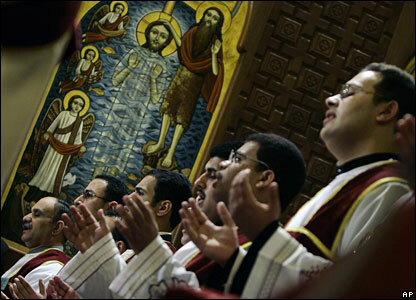 Since Mubarak’s ousting last year, Christians have become increasingly worried after an upsurge in attacks on churches, which they blame on hardline Islamists, although experts say more local disputes are often also behind them. Shenouda’s death, aged 88, has added to those anxieties and left Christians wondering how to make their voices heard when the Muslim Brotherhood and other Islamists have swept seats in parliament and are likely to have control over writing a new constitution. 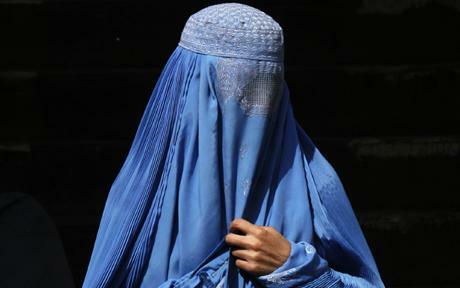 The pope’s post, temporarily filled by Biship Bakhomious, however, will not be filled swiftly. BEIRUT: A gathering of Lebanese Christian and Muslim religious leaders at Bkirki called for the bolstering of national unity and expressed sorrow over the political divisions in the country. “The gatherers discussed the situation in Lebanon and stressed the need to bolster national unity, which is based on coexistence between Muslims and Christians, to protect from the effects of the events in the region on Lebanon,” a statement following the meeting at Bkirki said. “We reject discrimination and strife, and stress the main Lebanese decision to remain together in an entity that is their final homeland, independent and united,” the statement added. 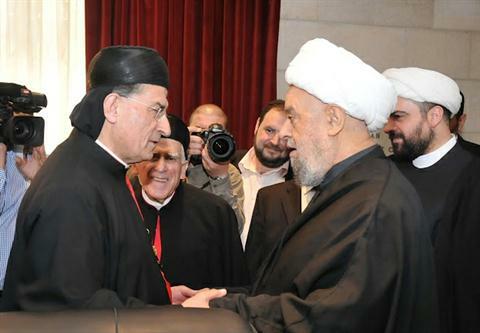 Participants at the event, which coincides with Annunciation Day, included Maronite Patriarch Beshara Rai, Grand Mufti Mohammad Rashid Qabbani, Sheikh Abdel-Amir Qabalan, the deputy head of the Higher Shiite Council, Druze religious leader Sheikh Naim Hasan, Greek Catholic Patriarch Gregorios Lahham III and Greek Orthodox Bishop Elias Audi. More than 200 people from the Presbytery and other Christian denominations, the Multi-faith Peace and Justice Alliance, several Muslim mosques, and Jewish temples from the area participated. Rev. Dr. Thomas T. Peters, First Presbyterian Church of Stirling, Imam Adel Barhoma of the Islamic Center of Morris County in Rockaway, and Rabbi Benjamin Adler of White Meadow Temple offered opening prayers. There were presentations on “What is Neighborliness and Being a Good Neighbor” by Imam Mohammad Qatanani, Islamic Center of Passaic County, Guillermo Lopez-Acosta, commissioned lay pastor atRidgefield Park Presbyterian Church and WhartonUnited Community Church, and Rabbi Adler. The crowd attended the dinner in the Fellowship Hall, broke bread together and chatted. 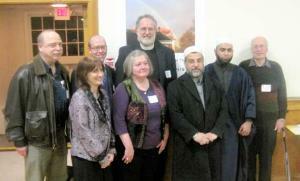 The menu included 15 types of soup, bread, salad and main dishes to accommodate all three faiths. The purpose of the dinner was to give participants the opportunity to network and develop relationships showing that their faiths encouraged loving one another.